If you have an example from your own work that you would like to showcase, please edit doc/gallery.rst directly and submit a pull request! Drake is being used to teach Underactuated Robotics at MIT. The course textbook has numerous examples of modeling, controlling, and analyzing many of the canonical problems in dynamics and control for robotics. The Robotics team at TRI is working hard to close the gap between simulation and reality. For manipulation, one important piece is accurate simulation of rigid-body contact. Michael Posa, Scott Kuindersma, Russ Tedrake. “Optimization and Stabilization of Trajectories for Constrained Dynamical Systems.” ICRA, 2016. Drake aims to have a wide suite of simulated sensors. As these tools expand, we’ll include video highlighting their functionality. Caelan Garrett has examples using Drake in his STRIPStream/PDDLStream task-and-motion-planning framework. 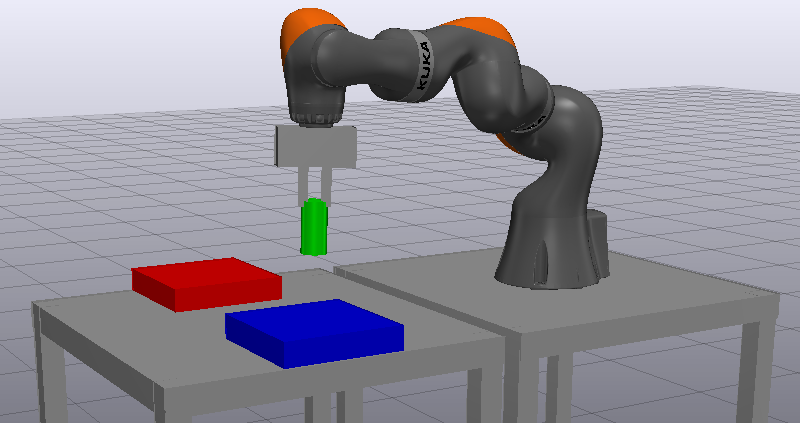 Greg Izatt put together a nice tutorial demonstrating how to put together a pretty complete simulation of kuka iiwa picking up a block with dynamics, planning, control, and depth sensing, all through the pydrake interface.